When trimming your budget, you look at the money you're forking over each month to have someone else do something that you could potentially do yourself. While many don't like the idea of venturing into unfamiliar waters, it certainly is possible to clean and maintain your swimming pool, spa or hot tub on your own. There's a big world out there with pool test kits, vacuums, plumbing, circulation, and surge-tank float valves. Don't be overwhelmed—there's plenty of DIY information out there, and we'll make sure you understand everything. The results? A clean, sparkling pool or spa. It’s time to use that pool test kit to check levels and water quality. Don’t panic if you didn’t take chemistry in school—the kit is fairly easy to use if you just follow the directions. Consult the photos and instructions in this step-by-step article to learn the right way to use a basic test kit, checking essentials like your pool water’s pH, total chlorine, total bromine, acid demand, and total alkalinity. You may have noticed your swimming pool handrails or ladder is corroding or rusting. All steels can rust or stain depending on what chemicals they come in contact with. The stainless steel grades used in pool rails and ladders are fairly impervious to swimming pool water that is in balance. However, unbalanced water chemistry and some other causes (poor electrical grounding, pouring chemicals near the rails, etc.) can stain or rust them. Find out how to keep them clean and safe. Learn the proper way to clean your cartridge pool filter. In just three steps, you will: rinse the loose dirt, soak the filter in a cartridge cleaner, and rinse again. This cleaning method is also excellent for diatemacous earth (DE) filters at the end of the swimming pool season. Do you have a chlorine generator or saltwater pool? How do you check the levels of salt to make sure it's correct. Please assure us that you aren't just buying bags of salt from the grocery store, opening then, and mindlessly flinging the salt into the pool? It's a good idea to check the website of your saltwater generator's manufacturer for instructions on adding salt. If you don't recall the brand or just need help, this list suggests smartphone apps and online calculators to help you maintain your pool and monitor the salt. Awesome: there's yet another thing to clean besides your bathroom and kitchen counters, floors, cat box, etc. Before you throw in the towel, this may be the most fun (if you're in the pool anyway) cleaning chores. Find out the easiest and most environmental way to attack those stubborn grout stains on the tile of your pool's waterline. 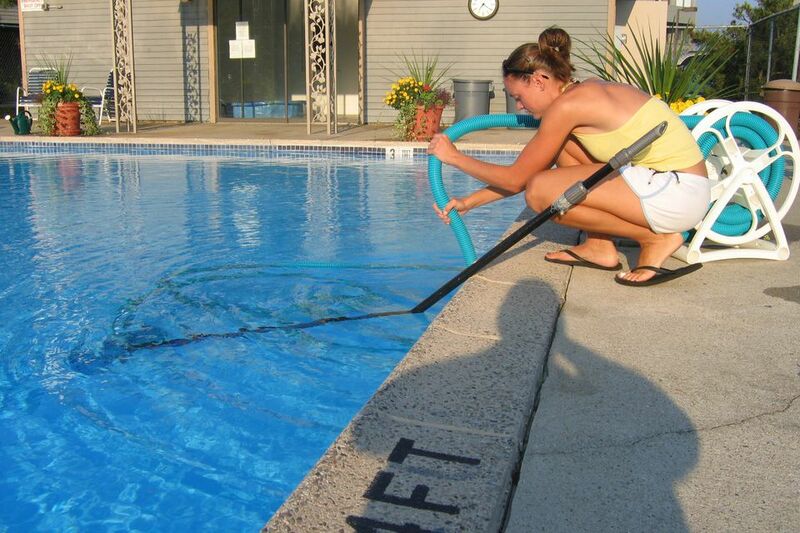 Robotics, suction, pressure: so many types of pool cleaners and vacuums from which to choose! So which one is right for your pool? Consult this handy guide, which describes each type along with what kind of pool requires what kind of cleaner. By practicing water conservation, you can save money and help the environment, especially if you live in a region affected by drought. In addition to using a pool cover, you can save water by checking for leaks, backwashing only when necessary, lowering the water level, and running the pool pump only as long as is needed. Time to Fill in the Pool? Are you done with pool pH, salt, filters, and winterizing? Is the estimate to remodel your swimming pool half of the value of your home if you sold it tomorrow? Maybe it's time to have the big pit filled in, especially if you no longer use it, the kids have moved away, and you find yourself spending more time maintaining rather than enjoying your pool. Think what you can do with the extra space: a she-shed, man cave, big sea of concrete, or a vegetable garden. Of course, there are those pesky, lettuce-nibbling rabbits to worry about.